this luxury is fitted with stainless steel appliances including a five burner gas range and a double oven all of which is surrounded by unique slabs of grey granite counters. Contrast that with the quirky, refurbished, bursting-with-color furnishings and voila- a crisp, clean vacation home with just the right amount of personality. Actually, the five balconies and porches, four large bedrooms and an open floor plan guarantee that there will be plenty of room for all the personalities you plan to bring with you, too! While it’s true that Blue Starfish is a short walk to the gorgeous beaches of the Gulf, its pool deck has been known to turn the emerald water even greener with envy! Get ready for a rant about the private deck’s amenities- a wall mounted flat screen TV is set on the back porch overlooking the crystal clear pool edged by a green lawn, a spa sits just above the pool with a small waterfall connecting the two, outdoor dining allows several families to dine alfresco on savory barbecue from the private gas grill, a custom-built wet bar with a refrigerator lets you refill your drink without having to go inside and finally a full pool bath right off the porch makes it easy to wash off sand before taking a swim! Whew! While listing that many amenities is exhausting, entertaining guests at Blue Starfish will be nothing but rejuvenating! The joyous tones of blue that envelop the exterior and interior combined with lively beach décor featuring curious sea creatures are sure to put a spring in your step! Go explore the nearby attractions like Uncle Buck’s Fish Bowl at the Destin Commons, Big Kahuna’s Waterpark, one of Destin’s famous golf courses, or a dolphin cruise on the harbor. Blue Starfish is set in the ideal spot for diving in to Destin’s fun! During Spring and Summer this home requires a 7-night, Saturday to Saturday stay. Any other time we require a 4-night minimum stay. We do not rent to anyone under 25 or to students. 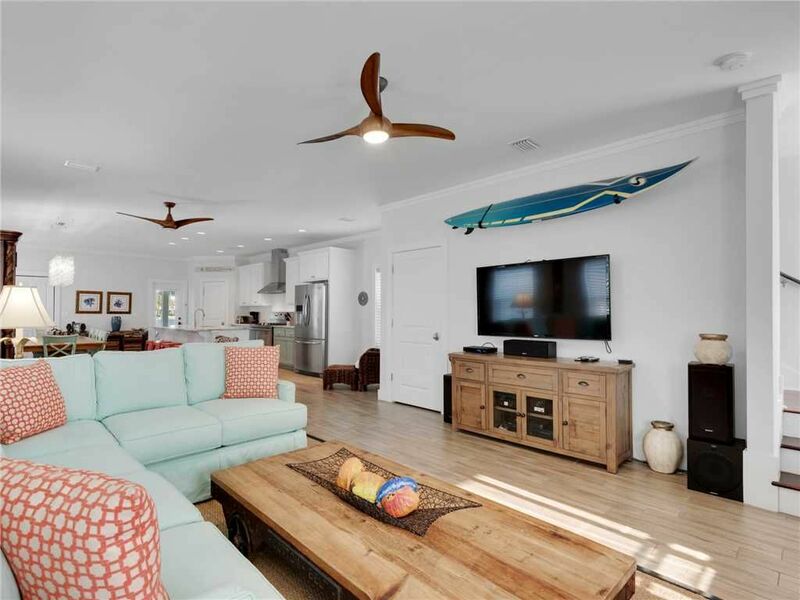 Newman-Dailey Resort Properties' premier vacation rentals range from Gulf-front condominiums to cozy cottages/townhomes to luxury beach homes. Newman-Dailey offers on-site or VIP check-in at some of South Walton and Destin’s leading resorts, including Sanctuary at Redfish in Blue Mountain Beach, Hidden Dunes Beach & Tennis Resort and Jade East Towers in Destin. Newman-Dailey also operates the 20-room Beachside Inn in Crystal Beach. Newman-Dailey has been welcoming guests to the beaches of South Walton and Destin, Fla. for more than 30 years, and consistently receives the "Certificate of Excellence" for positive reviews on TripAdvisor. The company was awarded the Better Business Bureau Torch Award for Marketplace Ethics in 2015 and voted "Best of the Emerald Coast" for vacation rentals and property management by the readers of Emerald Coast Magazine. We will definitively rent this house again. It's had a lot of games for the kids to keep them entertained and more than enough space for the whole family to enjoy ( which was 11 of us in total). Had a little hiccups but called the office and they took care of them right away. We definitively recommend this house. SPACE, LOCATION, AND COMMUNITY ARE GREAT!!! This house was perfect inside and out! Kid friendly and had so many of the things you would need while you were there! Blown away by the overall experience of this home and all it had to offer including being a short walk to the beach! We are already thinking of when we can schedule to come back! The pics you see online are exactly what you get and maybe even better in person! Newer pots and pans that do not stick. We absolutely loved it! Needs more seating on the main floor - a couch sectional would be a great addition. Everything else was superb! Thank you for your recent review of Blue Starfish. We are thrilled to hear you loved the property as much as we do. Thank you for your suggestions. They have been passed to the property manager so she may discuss possible improvements with the owner. We hope to have you back very soon. We had the pleasure of staying at Blue Starfish in September and we have to say that the home is amazing! I usually bring lots of stuff (cooking utensils, pots, waffle machine, etc.,and was overjoyed that everything we needed for the week was in the home. The whole house is decorated perfect along with hanging out at the awesome pool and beautiful porch. Our decision is made for next years Destin Vacation. A huge shout out to Newman Dailey for their extra help with our issue. They are so professional and helpful. We will always try to go with Newman-Dailey in our search for the perfect vacation home.